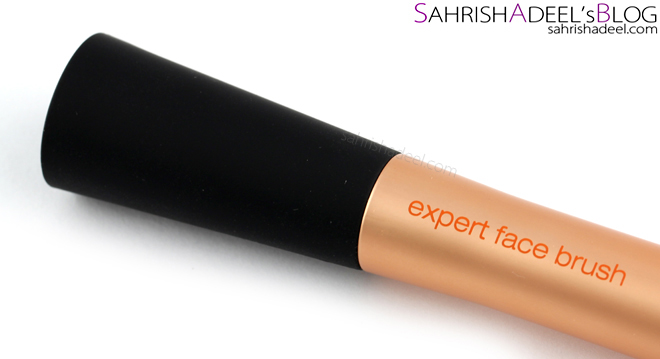 Expert Face Brush by Real Techniques - Review | Sahrish Adeel - Malaysia based Pakistani Beauty & Lifestyle Blogger! 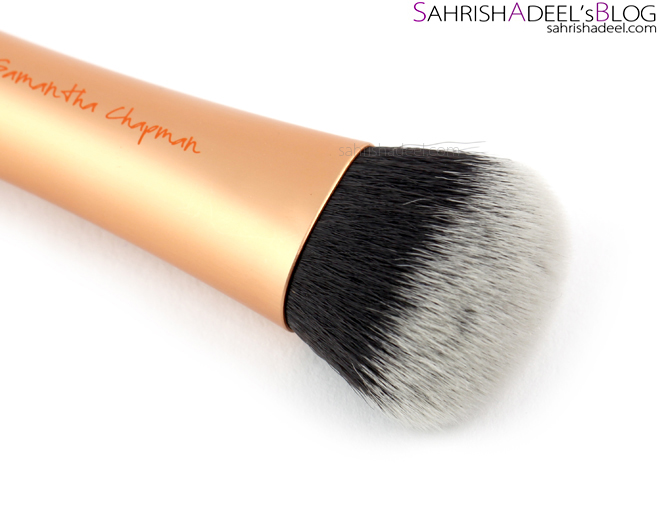 If you are following me on Facebook or in my friend list, you must have seen how much I have raved about this brush. 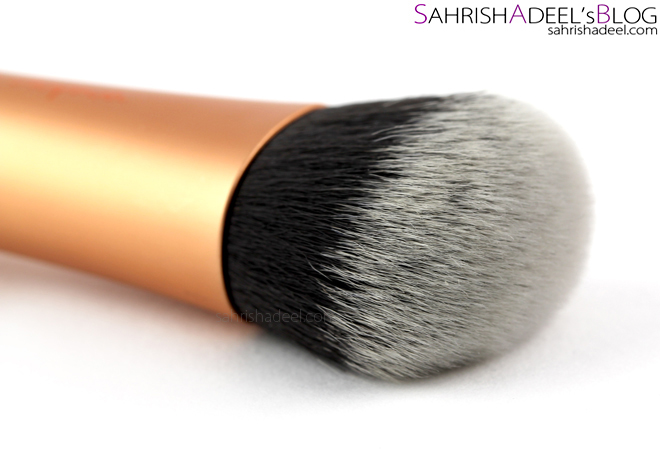 Reasons to fall in love with this brush were straight & simple which you will get to know in this post today. This brush comes in a transparent plastic packaging with complete how to details written at the back along with the photo of gorgeous Sam. I adore these sisters so much! 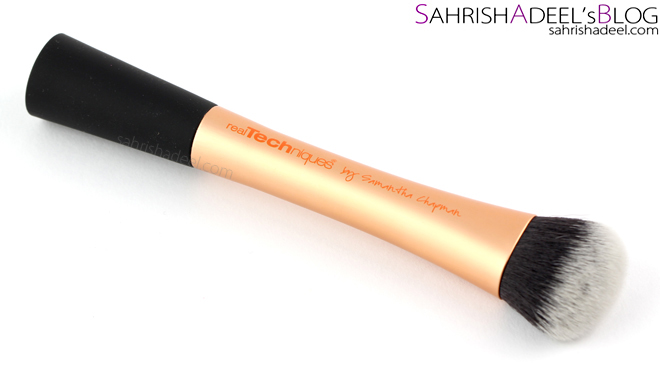 The brush itself has synthetic bristles, the orange / gold colored part is made up of metal and the black grip is made up of rubber material. One of the nicest feature in some of the RT brushes is that they has a flat bottom and they stand on their own which makes it really easy to place and pick from the vanity and they look decorative too. Every brush has a writing on the handle telling you what you can use it for; so thoughtful. Also, like Blush Brush, this brush also has a good weight to it which is a really important factor for me. I don't like too heavy or too feathery weighing brushes. 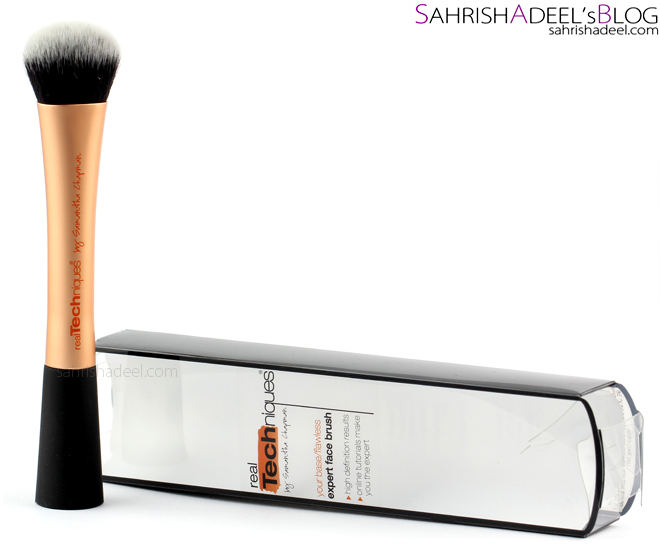 This Expert Face Brush has denser bristles at the base and are pinched to give the brush head a flat shape. The bristles are soft, semi-dense at the top. The top is not flat but is actually round so this brush can be used for multi-purposes. I have been using this brush for liquid / cream / powder foundations, finishing powders and contour products. It blends everything so flawlessly and quickly that I really find it faster than using fingers when I am in a hurry, which I am always in. I usually dab cream / liquid foundations on my face first and then spread and blend with the brush. For powder, I pick up the product directly from the pan / pot. For contour, I mostly use powders so I go for same picking-up method. Washing is easy too and since RT's brushes have synthetic bristles, they don't absorb too much product and do not get stained easily. I clean my brushes with a spray brush cleaner before every use but I deep-cleanse them by washing the brushes with a baby soap and let them air dry for the night. 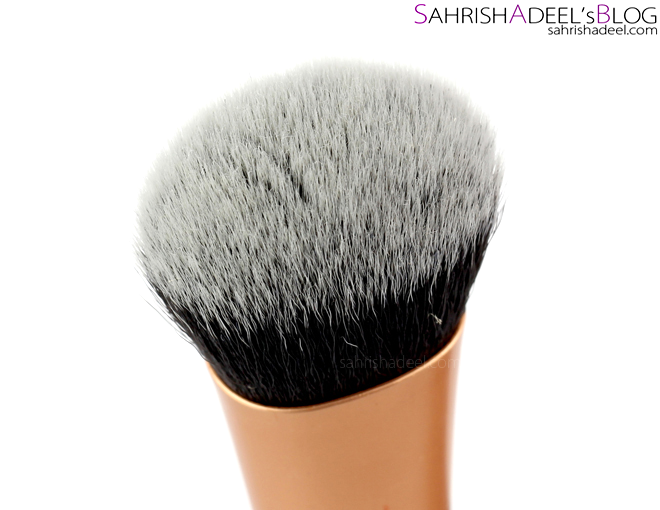 This expert face brush takes about six to eight hours to dry since the bristles are a bit tightly packed at the base. I also did not notice any shedding of bristles so far. Overall, I am absolutely in love with this brush. The design, bristles, shape and that softness is pretty functional and since I got it, I have been reaching to it every time I use a foundation / BB Cream. - Just4Girls.pk *Ships to Pakistan only. - You can find may individual webstores in Pakistan and all across the globe who are providing great services in arranging your favorite brands to your door steps, so make sure you do a bit of a research. Have you tried Real Techniques brushes? Which one is your favorite so far?